Alexios Komnenos, latinised as Alexius Comnenus (Greek: Ἀλέξιος Κομνηνός), was the eldest son of the Byzantine emperor Ioannes II Komnenos and his wife Eirene of Hungary. He was born in February 1106 at Balabista in Macedonia, was made co-emperor with his father at 16 or 17 years of age and died on 2 August 1142  at Attalia, Pamphylia. He was an elder brother of the emperor Manuel I Komnenos, and had a twin sister, Maria Komnene (plus other siblings). 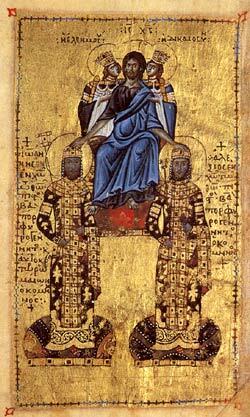 Alexios was made co-emperor by his father in 1122, but died in 1142. This was the year before his father's death as the result of a hunting accident. The reign of Ioannes II Komnenos is less well chronicled than those of his father, Alexios I, or successor, Manuel I, and coverage of the life of his son Alexios is very sparse. A panegyrical poem by Theodore Prodromos was addressed to Ioannes II Komnenos and his son on the occasion of the coronation of Alexios. It hailed both rulers as "kings born of kings and emperors, reformers of old customs and privileges, with whom the august throne and sceptre-bearing are a paternal acquisition, a matter of inheritance." The identity of his wife is uncertain. It is possible he was married twice, the first wife being Evpraksiya-Dobrodjeja of Kiev, a daughter of Mstislav I of Kiev, and the second being Kata of Georgia, a daughter of David IV of Georgia. While both women are known to have married members of the Komnenoi family, several theories have been suggested as to the identities of their husband or husbands. Choniates, Niketas (1984). O City of Byzantium: Annals of Niketas Choniates. transl. by H. Magoulias. Detroit. ISBN 0-8143-1764-2. https://books.google.com/books?id=O8arrZPM8moC. Magdalino, Paul (1993). The Empire of Manuel I Komnenos, 1143–1180. Cambridge: Cambridge University Press. ISBN 0-521-52653-1. https://books.google.com/books?id=0cWZvqp7q18C.